Rattray is a small town on the bank of the river Ericht. In 1929 it joined with the larger town on the south side and became the burgh of Blairgowrie and Rattray. It lies on the north side of the valley of Strathmore 16 miles west of Dundee and the same distance from Perth. 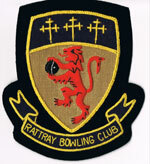 Rattray Bowling Club was established in 1921 and the committee appointed were mostly business owners, solicitors etc. with the Provost being appointed President. Fundraising activities included a fete at which £140.00 was raised. A sign of the times was a queue of over one hundred waiting to have their fortune told. The cost of laying the green was £300 and a wooden pavilion cost £400. In 1937 league subscriptions were 2/6, local rates £3.8s.4d., a new fence cost 13s 3d. and there was a bank overdraft of £42.16s.4d. The first lady member was admitted in 1949 and the ladies section was formed in 1956 with fees being 12s 6d. Work started on building the new premises early in 1960 with capital available at the time of just over £300 ( a loan was arranged but never utilised due to gifts and various fundraising events raising enough). All labour was done free of charge by club members and volunteers. 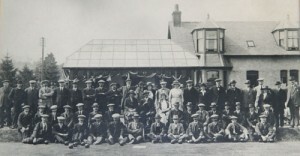 The club progressed tremendously over the next 25 to 30 years with membership increasing annually and premises being built for a games room, locker room and office with trophy cabinets bought to display the many trophies won by both the Ladies and Gents. The club have members who regularly play in the Perthshire County team. The club is very progressive, with the Ladies and Gents sections amalgamating in the year 2000 giving ladies full voting and playing rights. The club won the Perthshire Top Ten for the first time in 2006 when they represented Perthshire County in 2007. The club are delighted to have won this tournament for a second time in 2010 and look forward to competing against other Counties in 2011. We hope to do Perthshire proud. The Gents section has won the Strathmore Bowling League on numerous occasions and have also been successful in the Senior Strathmore Bowling League. 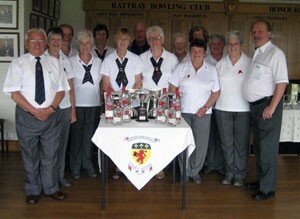 They participate in the Scottish Bowling and Perthshire Bowling Associations, also with great success. 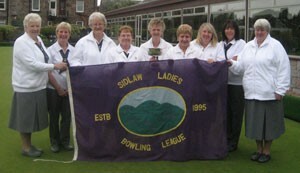 The Ladies section has won the Ladies Bowling League on many occasions making it a hat-trick 2006-2009. They also participate in the Angus and Perthshire, Perth and Perthshire and Scottish Women’s Bowling Associations with marked success. The club has recently registered its club colours of red with navy and yellow trim. Shirts and jackets are now worn with pride by members of the club. Rattray Bowling club opens its doors to the community during the Summer and Winter with pool competitions, a dart league and social events. New members and visitors are always made welcome.